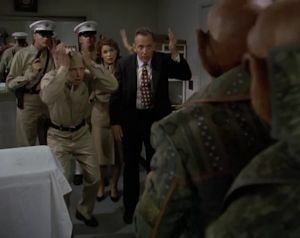 Quark, Rom, and Nog accidentally crash their new ship into 1947 Roswell, New Mexico. The Ferengi version of Heaven and Hell--the Divine Treasury and the Vault of Eternal Destitution--is really funny. I especially like the Blessed Exchequer. When Odo finally makes his presence known, how come nobody is watching them from the other side of the mirror? There's not much to say about this episode. It's goofy, campy, and ridiculous, but intentionally so. There are some serious undertones in the social commentary--reflecting on humanity's capacity for reckless self-destruction from tobacco to the atom bomb, a lot of interesting feminist critique moments, and Quark's ultimate judgment that humans are "a bunch of violent savages" just underneath the surface, etc.--but on the whole, this episode is intended as an homage to the cheese-tastic sci-fi of the late forties and early fifties, the kind of stuff that inspired Roddenberry in the first place and thus could be considered part of Trek prehistory. As such, it's a success, and one of the rare cases of Star Trek pulling off a humorous tale. Quark talks about being able to give the Ferengi warp drive before even the Vulcans, but we learn in ENT that Vulcans were warp-capable well before 1947. For example, in "The Andorian Incident," it is established that the P'Jem monastery was built around 850 BC, meaning that Vulcans were capable of interstellar travel at that point.